We are excited to showcase one of our favorite projects to date: this beautiful partial remodel for a Woodland Hills home, owned by Los Angeles based actor Gavin Houston. From new coffered ceilings throughout the living room and master bedroom to a complete master bathroom remodel, this once dark and outdated home is now a modern and bright space with gorgeous fine art touches and handpicked focal points to infuse it with personality. The new master bathroom features all white marble patterned porcelain tiles on walls and floors, white quartz countertops, custom frameless shower and freestanding tub, a custom makeup table and a custom double vanity with white shaker cabinets, and a reclaimed wood barn door for a touch of color. The bright and spacious master bedroom also gained a new focal point with a Venetian plaster wall with LED lights behind the bed, and coffered ceilings that were also added to the living room. 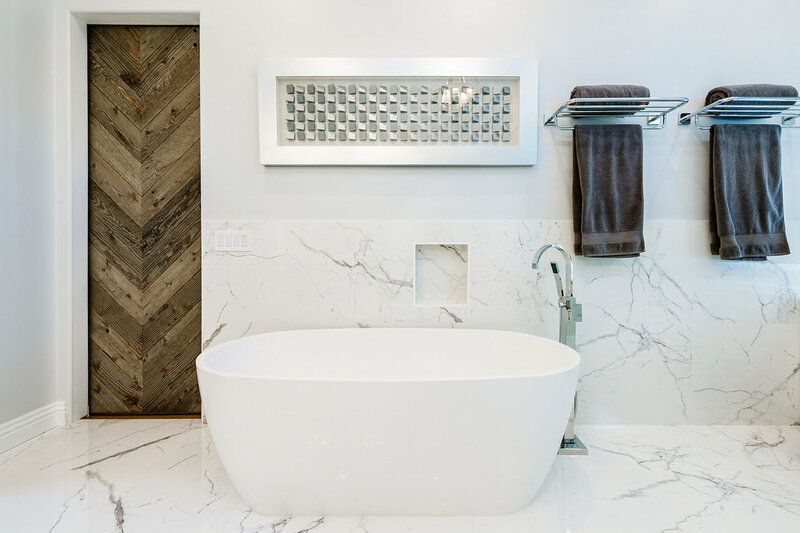 The new master bathroom features porcelain tile floors and walls, Caesarstone quartz countertops, custom shaker cabinets, freestanding tub, stepless shower with infinity drain and custom frameless doors with rain shower head and waterfall shower combo and body sprayers. The bathroom door was replaced with a custom barn door with reclaimed wood. Refined living room with new coffered ceilings. Open floor kitchen facing the living room. Master bedroom featuring new coffered ceilings and chandelier, entrance to the bathroom with custom barn door made of reclaimed wood, and new wall behind bed with venitian plaster and LED lights. Master bathroom featuring new coffered ceilings and chandelier, entrance to the bathroom with custom barn door made of reclaimed wood, and new wall behind bed with Venetian plaster and LED lights.